Don’t worry about crowds—they aren’t here yet, don’t sweat the bugs, and get ready for some of the best camping you’ve ever experienced (ahh, those cool springtime nights!). These are some of the best places to camp in Northern Michigan. Plus, we threw in an awesome breakfast to cook over your campfire. Camping, with a side of cool Michigan history. Nestled in the woods, North Higgins Lake State Park offers modern campsites as well as two mini-cabins and a boat launch (west campground opens late April, while semi-modern sites in the east campground open May 18, starting at $22/night). Explore the 8+ miles of trails by foot or bike, and bring along your kayak for an adventure on this 9,900-acre lake known for its deep, clear waters. The park is also home to the Civilian Conservation Corps Museum, which tells the story of the more than 100,000 young Michigan men who were enrolled in this federal Depression-era organization. During the 1930s and 1940s, “CCC” men lived in rural parts of the state, working on natural conservation projects. The CCC Museum is open by appointment prior to Memorial Day weekend. Grab lunch at Paddle Hard Brewing, where you’ll find the brewery’s own creations as well as a range of Michigan craft beer. Go rustic, close to the lakeshore. 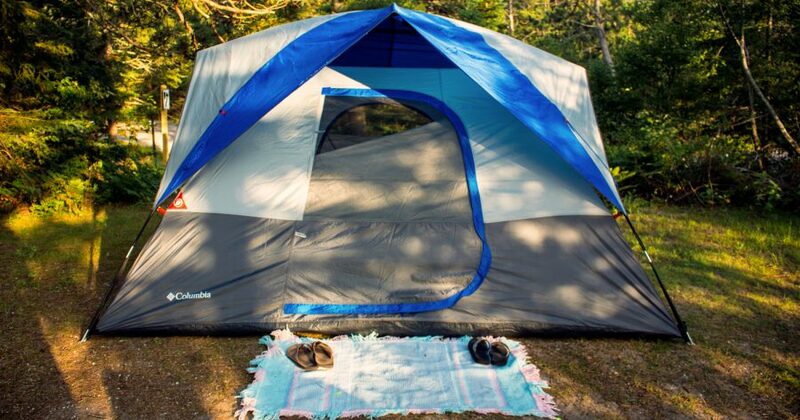 Just five miles from Lake Michigan and Sleeping Bear Dunes National Lakeshore, the wooded and peaceful Empire Township Campground offers an intimate camping experience. Pitch your tent amid hardwoods or between rows of towering pines. The campground, which is open May 15–September 15, features nine sites with electricity and three group sites. Sites start at $25/night; group sites are $40/night. Coin-operated showers, a flush toilet, ice, and wood are available onsite, as are outhouses and drinking water. Reservations by email at empiretownshipcampground@gmail.com. Spend the day perusing the shops in Empire. Satisfy your chocolate desires at Grocer’s Daughter Chocolate, housed in the funky bright green building just south of Empire’s single stoplight. Lunch is delicious burgers at Joe’s Friendly Tavern. Afterward, hike Empire Bluff for breathtaking views of dunes and water. Just two miles from downtown, the 47-acre Traverse City State Park is popular for its proximity to everything the town has to offer. For starters, the area’s beloved TART Trail is within walking distance, and the park’s quarter-mile of sandy beach is just across the road (use the walkway bridge for safe crossing). Hop on the paved trail accessible at the rear of the park, and bike in either direction for a multitude of dining and playing options, including a coffee shop about a mile east (Breakaway Cafe; breakfast burritos to die for) and a microbrewery to the west, close to downtown (The Filling Station Microbrewery; try the Station Salad and the Rocket pizza with your brew). Soak up seriously gorgeous scenery. Multi-colored sandstone cliffs, agate beaches, waterfalls, inland lakes … explore it all during your excursion north to Munising, on the Lake Superior shore. Seeking waterfront vistas? Check out Munising Tourist Park Campground for views of Grand Island and Pictured Rocks National Lakeshore. The 127-site campground opens “no later than May 15,” according to its website. The property includes 78 sites with electric and water hookup and 23 walk-in rustic tent sites ($25–$41/night). For camping close to the area’s myriad waterfalls (and 440 acres of walking trails), book a stay at Wandering Wheels Campground, three miles southeast of Munising on M28. Tent-and-RV camping and cabins are available. Be sure to stop by Falling Rock Cafe and Bookstore, Munising’s home to thousands of reads, free wireless, homemade food with vegan and gluten-free options, coffee and tea, and ice cream. U.P. Travel Tip: Any time is a great time to visit the Upper Peninsula’s waterfalls, but May is especially rewarding. The rivers are surging from spring rain and snow melt, and mosquitoes and biting flies are still pretty dormant. Watch this video of U.P. waterfalls and you’ll definitely get the travel bug. Cook breakfast in a bag? Yes, it’s delicious.